I normally am not much of a pointing-out-mistakes kind of guy. But I figure, it is not that bad if it includes a bit of humor. 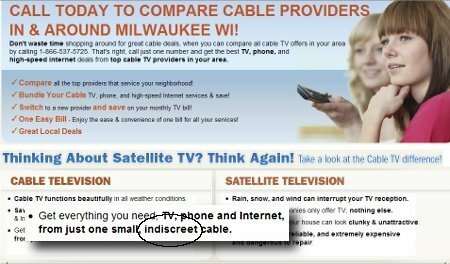 So this other day I was looking up cable companies in Wisconsin. This site helpfully popped up claiming to tell me why cable was better, by pointing out the differences between cable and the dish. Which it did, helpfully pointing out that the cable is quite indiscreet. I am sure they were thinking discreet, but unfortunately they let the cat out of the bag instead. WOW. If you have an hour and 20 minutes at some point, this is a must see. The Wave is Google's ambitious replacement of the email, instant message, tweet, blog and pretty much every other means of communication and collaboration currently available. But Google's approach to do this is not by providing yet another replacement, but by linking to these means of communication and extending them transparently. At its heart, the Google Wave is email done right. Updating the current paradigm of point to point communication bursts offered by email, Google Wave offers a centralized client-server real-time collaborative alternative. What this means is that email is no longer delivered to your Inbox. Instead, your Inbox is a sort of a window into a central location, that essentially hosts a dynamic, ever changing web page which is your email. As people contribute to this web page - called the Wave, the client (in this case a HTML 5 compliant browser) automatically updates itself to reflect a common shared view. If that is all that Google Wave was, then it would potentially have ended up as an optional Google Labs widget for Gmail. Instead, the Wave team took this further. They added real time - character by character refreshes; provided drag and drop functionality for rich media like photos and videos; enabled collaborative edit features for all content; and provided a means for existing communication mechanisms to interact with the content and updates. Suddenly the Wave seems much more than just a handy email gadget. Instead, it is a new way to think about communicating, sharing and collaborating. The best part about Wave is that it forces you to think differently about communicating, by providing fundamentally different tools and mechanisms. A particularly enlightening moment in the presentation is when an old Wave was dug up where participants initially began communicating serially like an email, and realized mid-way through the process, that there was a potentially more productive way of continuing the same conversation through the editing features provided in the tool. It is this ability to simultaneously apply two diametrically different paradigms, that is the real potential for Wave. Users will no longer have to choose to learn a new paradigm - instead they can choose to stay the same, and wean off at their own pace. The second major feature has to be its extensibility. The opening remarks encapsulated Google's approach to Wave - as a Product, Platform and Protocol. True to looking at it as a protocol, Wave developers seemed to have incorporated several real-world requirements into it. One example that sticks out is the ability for multiple Wave implementation to keep each other abreast only of updates that they really 'need to know'. Such an approach reflects today's Legal discovery requirements really well, and demonstrates Google's commitment to making this a broadly acceptable protocol. The potential issues that Google will face in trying to establish a Wave based communication platform will probably not be technical to Wave at all. Google Wave assumes that ubiquitous connectivity, which seems to be the direction they have been driving with all their offerings. Of course, the Wave is going to use HTML 5's cache functionality to provide offline usage, but connectivity is still going to be critical in Wave's acceptance. HTML 5 brings another item of resistance for Wave's acceptance. It was only recently that Firefox finally overtook IE6 in terms of usage. Browser adoption has and will never be as cutting edge as Google will want it to be. Not having a HTML 5 compliant browser will effect Wave's adoption. The second issue will be user acceptance. People have gotten used to email in the traditional sense. For the vast majority, thinking in terms of email is as far of a change as they can fathom. Forcing a truly dynamic paradigm upon them, may not be very successful. The third issue is corporate acceptance. Large scale user and technical acceptance of new technology has always been tied to acceptance in the corporate world. Your company pays for you to learn something new, like say email, and you then take it up on your own. Wave offers collaboration aimed at smaller, widely dispersed teams. Unless companies are convinced about the benefits of Wave-ifying their email or IM, it may end up remaining just a geek's toy. BING is the new name for Microsoft's search, formerly part of their LIVE suite of services. This seems to be a good few months for search. Just a few weeks ago we had the inauguration of Wolfram Alpha, and now the Bing. Microsoft purportedly was very focused on verb-ifying their new offering and therefore had to go with the 'ing' ending. But Bing? As Chandler would say, Bing is Gaelic for 'Thy turkey is done'. Bing has been live for a while, and it is not really all that bad. My bone of contention with its predecessor, Live search, was the super-heavy pages used to display results, and not so much the quality of the searches themselves. That seems to have changed with Bing. The pages seem quick. Not much of a fan of the changing main page background, but maybe that is just a matter of getting used to it. Of course, if you want to see the previous photos, you have to install Silverlight. I guess for me, that is what makes Microsoft so annoying. It is like a car salesman that just wouldn't give up. It is always a matter of, 'I will give you this if you want that'. Microsoft properties online seem to acutely make you aware that you are a guest and therefore need to mind your manners and clicks. The constant struggle for one-up-manship reminds one of a petulant child, unhappy about the attention being showered on younger sibling Google. One more matter of annoyance before I move on. This one specific to Bing. I don't think I am much of a fan of location assumptions being made by the software and then filtering my results without really letting me know about it. Seeing local search results surreptitiously is almost like those sleazy ads one sees online, from ladies starved of physical affection who magically know where you live and want to make a tryst with you. I may be using a proxy - did Bing think of that? Filtering my results for Indianapolis, Indiana when I am not even in the same state, isn't smart as much as it is annoying. Bing seeks to bring travel into the search engine. As an example, they trot out the ability to book flights to Hawaii. Apparently, that is all there is to it. Try booking a flight to Milwaukee, and you are back to Expedia or Travelocity. So maybe, Hawaii wasn't so much as a feature, as it was a demo. Maybe we need Silverlight to be able to book tickets everywhere else. Overall the search is in there somewhere. The interface is definitely better, and worth checking out. It has a few new demos of potential new features to come. Otherwise, it is pretty much same old, same old.